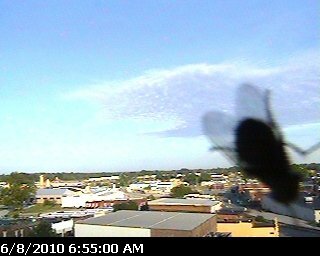 Could someone run up and knock the fly off our web cam? Expect a warm day across Cookeville with a high of 87°. We started in the upper 50's to around 60° this morning. In fact, it was a comfortable 60° at the time of this post (6:55 am). Overnight, I expect the skies to become cloudy with a low of 70° and then we'll see storm chances each day through the weekend with a return to higher humidity levels.